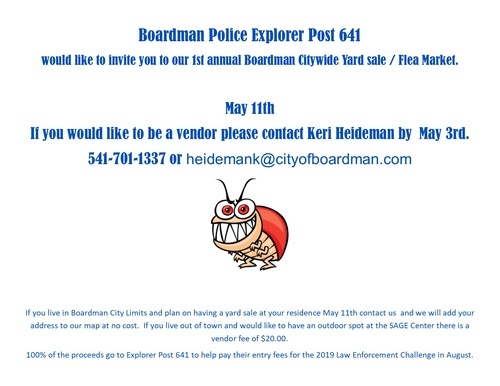 Boardman Police Explorer Post 641 would like to invite you to their first annual city wide yard sale and flea market. If you live in City Limits and plan on having a yard sale, please call by May 11th and they will get your address on the map. If you live outside of city limits and would like to have an outdoor spot at the SAGE Center there is a vender fee of $20.